Quod erat demonstrandum (Latin: “which was to be demonstrated”) traditionally denotes the completion of a mathematical proof or philosophical argument. As Terje Rypdal’s opus 52, however, it seems to mark the start of one. The 36-minute work for electric guitar and chamber ensemble is, on the surface, a hard sell. Jazz purists may be perplexed by its chamber music abstractions, while the classical side of the fence may find it lacking in innovation. In the absence of expectation, however, one encounters an unpretentious and atmospheric work of sometimes startling beauty. The 1st movement sets a deceptive tone. Its abstract conglomeration of strings and winds flits through the trees like a Cheshire cat. The 2nd movement, however, introduces Rypdal’s electric, which sings amid a brassy swell of delirium into the 3rd movement. His labyrinthine keening works especially well here while the insistent strings build tension. The deep rumblings of the 4th, however, open like the gates of an alluring netherworld, where orientation is a bluff, grained like a hoarse voice in the echo chamber of time. This seems to be the center of all the activity we have endured—all the more so when we contrast it with the hulking 5th movement, which juxtaposes edges rounded and serrated, cacophonous and nearly silent, gilded by Rypdal’s reversed guitar and flung into a molten pit of scrapes and scrambles. To this, Rypdal appends his Largo, op. 55, a 17-minute stretch that further maps the subterranean concerns of Q.E.D.’s 4th movement. The composer’s ever-mournful song blasts its heat waves through the chest with the insistence of a dragon yet the gentility of a feather caressed against the cheek of one’s preconceptions. A curious and multifaceted thing, Q.E.D. is filled with mysterious rewards for those patient enough to seek them out. By no means where one should start with Rypdal, but nevertheless a competent blip on ECM’s eclectic radar. 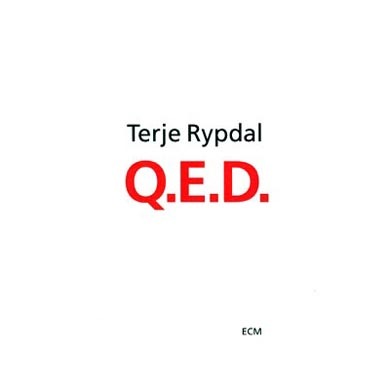 Thanks for finally talking about >Terje Rypdal: Q.E.D. (ECM 1474) | between sound and space <Loved it!